Disc Brakes: How do they work? Nowadays, almost every serious sportive cyclist is equipped with a set of blinking disc brakes on his/her bike. Some love them and others see them as unnecessary add-on. But, fact is that they help you as a cyclist on every challenging ride. So, we will explain how these disc brakes work and what needs your special attention. There are disc brakes in two different system variants: mechanical or hydraulic. Both will provide you with very good braking power in dry and wet circumstances and are very durable. When using the mechanical disc brakes, the power that you use to pinch the brake lever will be transported to the brakes through a cable. It works the same as conventional brake systems. If you have used it intensively or for a longer time, the cable will stretch and the braking power shall decrease. In this situation it is time for some maintenance. The hydraulic disc brake works with oil that is transported through a brake line to the calliper. The pressure of this transportation will push the pistons in the calliper towards the disc. Benefit is this system is its weight, it is lighter than the mechanical one. Besides this, it gives you the opportunity to brake more moderate. An ingenious system that knows less power loss. More power will be preserved. But, it is possible to get air into the line which makes it necessary to bleed the brake system. And this will be a precise task. Bleeding your lines was never so easy. There exist a lot of different kinds of discs but only two ways to mount them on your wheel. The 6-bolt is the most common manner. In this case the disc will be attached to the wheel on six different points. It is very important to keep the disc centered when mounting it. Do you want to be secured of a well aligned disc? In this case you can use the Centerlock system. With this system you mount the disc to the wheel by using a big ring. This makes sure the disc will always be centered on the axle of the wheel. When you use BBB discs you have to use an adapter when you want to work with the Centerlock system. Mount your 6-Bolt disc also on a Centerlock system. Discs are available in different sizes from 140mm to 203mm. 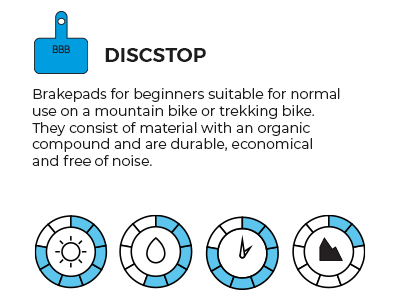 When choosing the perfect disc for your bike there is one general rule. The bigger the disc, the harder and better the braking. Bigger discs are used for the heavier braking work. And they will cool down more quickly. But on the other hand the smaller ones are a bit lighter. If you made your choice for the best width, make sure you mount the correct adapter as well. Because the calliper needs to be on the right distance for the disc to fit in. Disc brakes in all sizes. The last part of a disc brake system are the braking pads. These exist in a lot of different kinds. So, it is important to select which pad fits in your braking system. For all disc brake systems we have four types of pads available. 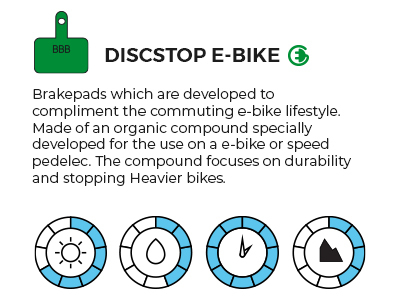 The DiscStop, DiscStop E-bike, DiscStop HP and DiscStop Sintered. 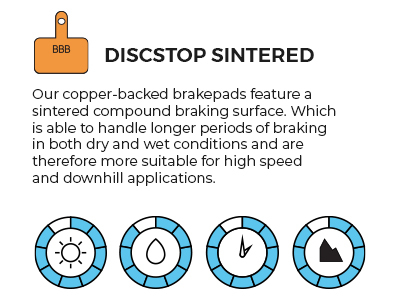 Our product range in braking pads is compatible with all regular disc brake systems.  From Shimano, SRAM / Avid, Magura, Hope, Formula, Tektro, Hayes and Giant. 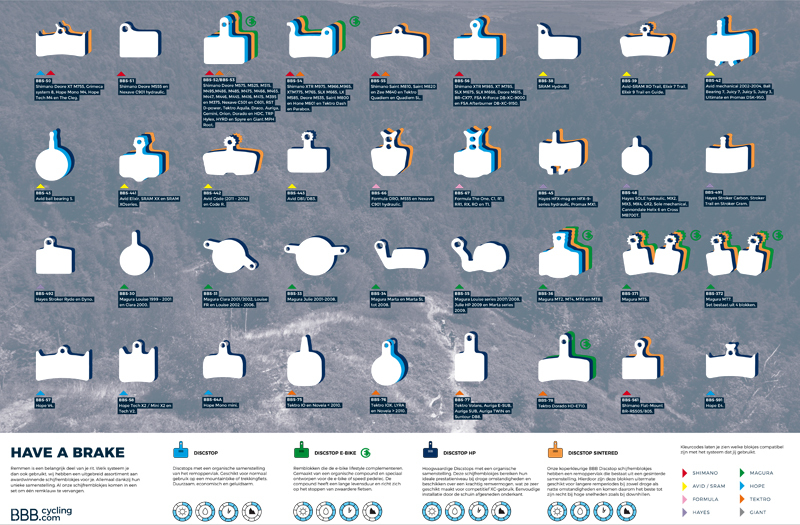 Use the picture below to check which pads are a fit with the disc brake system on your bike. Enlarge the picture by clicking on it or check it out here. Check out the disc brake poster here. How to maintain your disc brakes? Adjusting and maintaining your disc brakes is lees difficult than you think. Only if you have a set of hydraulic disc brakes you need to get used to the system. But, with some extra tools you can easily maintain your own braking system. It isn’t more difficult than working on conventional brakes. 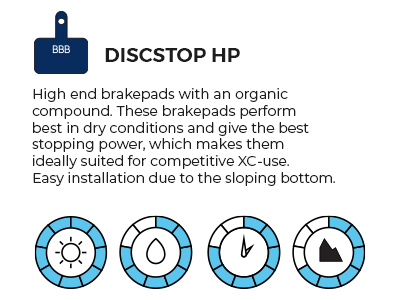 Want to read more about the maintenance of your disc brakes? How to adjust a disc brake? How to replace disc brake pads? How to change a disc brake, disc? When maintaining your disc brakes, watch out with using oils and other lubricants. Even oil on your fingertips can have negative effects on the braking power. Did you get grease on your fingers while working on your bike? Don’t forget to clean this part of the bike properly or replace this part.